The Moultrie line of game cameras is a quality line with satisfied customers. In fact the Moultrie game cameras are fairly popular among hunters who are often glowing at the results. These are premium cameras that help you to maximize data collection to monitor the natural habitat of the wild. The models vary from high definition models to No-Glow technology models with wide angle viewing, and all the cameras produce top quality color images. Representing a new wave in game cameras, the M-990i No Glow feature allows you to snap a photo of a person walking by in the middle of the night without them ever know the camera was there. This new No Glow technology is not only undetectable to the eye but it also helps you to get a true image without compromising quality. The M-990i has a built-in two-inch LCD screen that allows you to view photos and videos on location. There is a barometric pressure, moon phase, temperature, time, date, and camera ID stamp on each image. The M-990i also features FastFire Continuous Shooting that can snap up to an impressive four images per second. Additionally, the camera can store up to 9,500 images on an SD card. I really do like this camera’s recovery speed, and the detection zone is top notch. It has a 70-foot night range, and its Motion Freeze technology will help reduce night-time blur. The M-990i offers four operational modes: an IR triggered plot game camera, a time-lapse plot camera, plot camera by day and motion detector at night, and day and night 720p HD video. This camera offers top-of-the-line quality for a respectable price. While this camera is more expensive than some of the other models, I can promise you the added features are worth the money. Up to 9,500 pictures on one set of batteries. The camera’s battery consumption is high. The M-990i is one of the more expensive products in Moultrie’s arsenal. However I believe with the technology and features packed into this little gem, it is worth it. The No Glow feature allows for covertness. With a good detection range as well as being password protected, you can be sure this is worthy purchase. You can be pretty comfortable knowing that you have made a sensible investment. The M-1100i is definitely one of the best cameras by Moultrie. This is the beast of their line. The camera is one of the most advanced mini-cameras available on the market. The M-1100i has 12 MP resolution and full 1080p HD video and takes your scouting to a whole new level. This camera allows you to easily see your prey at night with its No Glow illumination flash that has a range of 80 feet allowing for sharper images at nights. The M-1100i allows you to check your images in the field with its built-in two-inch color display. The camera reduces the risk of blurry images with its half-second trigger speed. 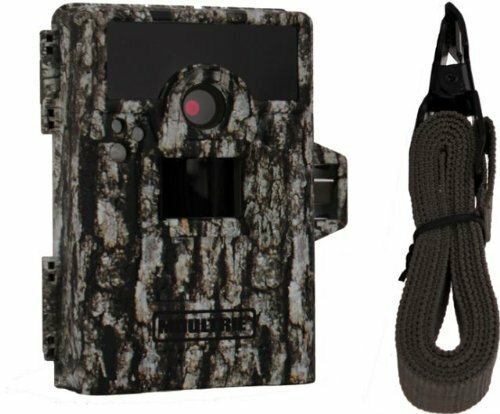 The camera can be concealed against a tree using Realtree Xtra Camouflage. There is no doubt that this is one of the best cameras in the Moultrie line. In fact the company sees this camera as its pride and joy. The best feature is its invisible No-Glow illumination flash that keeps the subject unaware of the presence of the camera at night. Camouflage keeps the camera hidden during day time, and for the price I think this is one of the best cameras on the market. 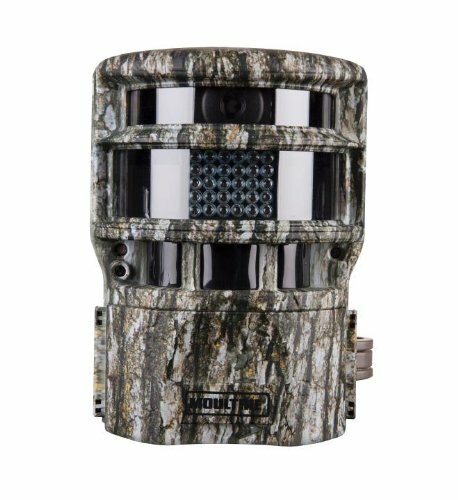 The Panoramic 150 specializes in capturing high quality, super-wide digital images of deer and other wild game that pass through your hunting camp. This camera is unique as no other camera offers a panoramic photo feature. This camera allows you to monitor really wide areas which means you can use one camera as opposed to hanging up multiple cameras to cover the same area. The Panoramic 150 takes three separate pictures and combines them into one. What I really like about this camera is that it swivels without making any noise giving you a incredible 150-degree field of view. The rugged construction also stands up to the elements, and its stealthy design makes it virtually invisible to game. This is a good product that offers value for money. Photos have an overlap/separated appearance. 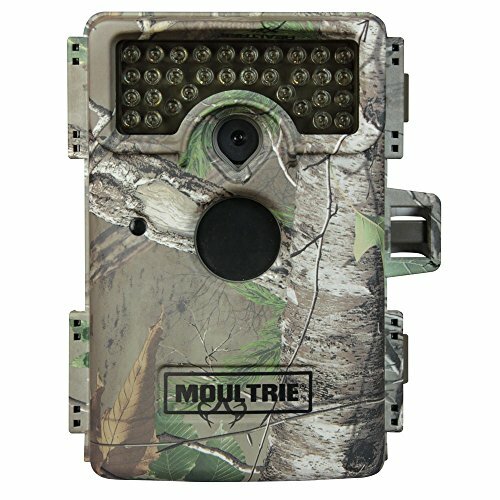 This is another high quality camera by Moultrie. I believe this is also a camera that gives good value for the price. With a quick trigger speed, fairly long battery life, motion freeze, and a wide view area (150 degrees) that is un-matched, I think you will be pleased with this camera. Moultrie has some high performing game cameras in their line. The Moultrie brand is a leader in game cameras, feeders, and game management technology and these three cameras are a good representation of that. My personal favorite is the Moultrie Panoramic 150. I find the price reasonable and that the super wide view is unmatched. The Moultrie M-990i No Glow Game Camera with multiple power options is my second choice. If you are looking for more resolution, you can’t go wrong with the Moultrie M-1100i with its 12 MP. Happy snapping!